I recently had the pleasure to work on this challenging illustration featuring complex processes in underground pipeline cleaning. To create an illustration such as this with only a final static visual is a challenge to even the best Technical Illustrators. Showing the complex details while keeping the overall illustration showing a simple flow is what makes this illustration stand out above it’s competitors in the marketplace. In this particular process, there is a a downstream and upstream truck above ground that pushes water into the pipeline below and with the help of a high pressure nozzle, water pushes debris towards the pump that pumps the mixture back into a holding tank on the street. This holding tank then separates the debris from the water, systematically pumping the water only back into the pipeline below. The illustration had to show specifically the process below ground as well as the protocol-adhering setup above ground so that traffic flow is considered while the process is taking place. 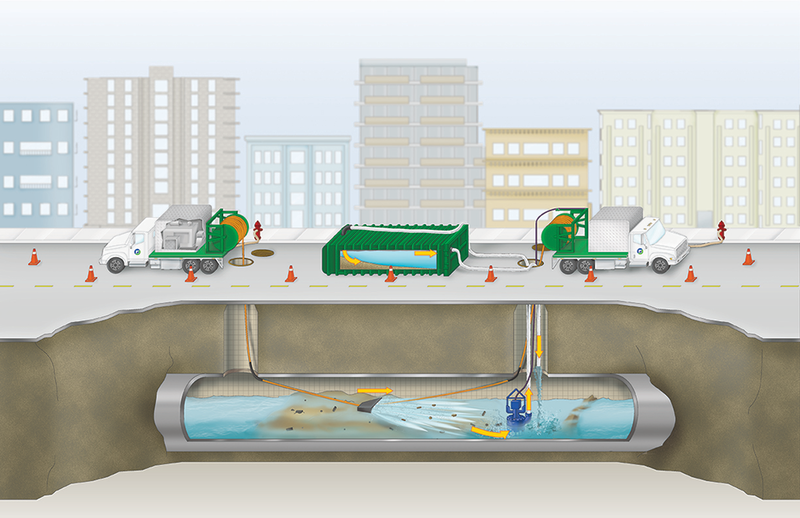 The cutaway view illustration allows the viewer to see both the above and below ground processes all at once for an overall greater understanding of how city pipelines are cleared of debris. Thanks to Diane for her assistance in seeing this illustration come together for PPSI.